To revert to the 2nd Loyal’s, this unit had reached. Naples on the 24th December, and on Christmas Day had entrained for Ancona on the east. coast of Italy. On arrival, there five days later, after a tedious journey via Rome, the troops were taken by motor transport to Urbisaglia, a mountain village near Macerata. Here the main body of the Battalion were accommodated in a villa, a school and a hospital, while two companies were sent to the neighboring villages of Colmurano and Loro Picono. On the 9th January, 1945. a large draft. composed mainly of men from the Loyal’s anti-aircraft units. brought the strength up to thirty-seven officers and 780 men. Training was now resumed, with emphasis on night operations; and during the next two months’ parties of officers and N.C.O.s. were sent off to gain battle experience in the line. On the 27th January, the Battalion began reorganizing on a four-company basis. and five days later the newly formed company was established at Petriolo. . The 2nd Loyal’s moved to Foligno on the 19th February. The following day the four rifle companies were accommodated at Rignano, ten miles east of Florence. and the remainder of the Battalion somewhat nearer Florence on the south bank: of the River Arno. On the 23rd the 2nd Loyal’s moved. to the Villa di Castello, between Florence and Sesto, where they came under the loth Indian Division. Here they remained. until the 20th March, when they moved to a staging area at Molezzano, north-east of Borgo San Lorenzo. Two days later they moved up to San Clemente, taking over from the 2nd Battalion, Highland Light Infantry, a reserve position on the Rignano spur, a foothill of Monte Grande. On the 2nd April and the following day, the 2nd Loyal’s, now under command of the 20th Indian Infantry Brigade. relieved the 3/5th Mahratta Light Infantry in a forward sector on the Bazzano spur. an off-shoot from Monte Cerere. C Company (Major R. E. S. Beirne), occupied the high ground at Bazzano, with D Company (Major J. B. Hamilton), on its right, then A Company (Major R. McN. H. Fraser), and finally B Company (Major D. F. Surfieet), on the lower slopes of the Sillaro valley. AI Echelon was located west of Boston By-way, in the valley between the Rignano and Bazzano spurs. In this sector the forward troops had to stand-to all night. The Germans were well aware that a big offensive was impending, and in the early hours of the 4th April delivered a spoiling attack against the positions held by C Company, 2nd Layal’s, and the Sikh battalion on their left. This attack: began at 1.30 a.m., when a derelict farmhouse named di Sotto was heavily shelled, as was also a hillock on the forward slope of the Bazzano spur, known as the hump; both of which were held by C Company’s forward platoon. Within the next quarter of an hour the enemy had worked around the flanks of the hump, which they then attacked from the rear, killing the sergeant commanding the section and two men. Flamethrowers were being used against di Sotto, when a counter-attack led by Captain P. A. Williams was delivered, which retook the hump and drove the enemy off. In the course of this action C Company had three men killed, seven wounded and five missing, but one of the latter later returned. The enemy, who were also repulsed by the Sikhs, must have had considerable losses, for five ambulances and ‘a stretcher case were later seen moving northwards down the Sillaro valley. C Company was mortared on the night of the 4th April, losing one man killed and three wounded, and twenty minutes later B Company had one man killed and another wounded from the same cause. There was much patrol activity on both sides each night until the 10th April, when the 2nd Loyal’s were relieved by the 3/ 5th Mahratta’s and returned to the reserve position on the Rignano spur. The following morning the 2nd Loyal’s took over the Grande-Farneto sector from the 3/18th Royal Garhwal Rifles. 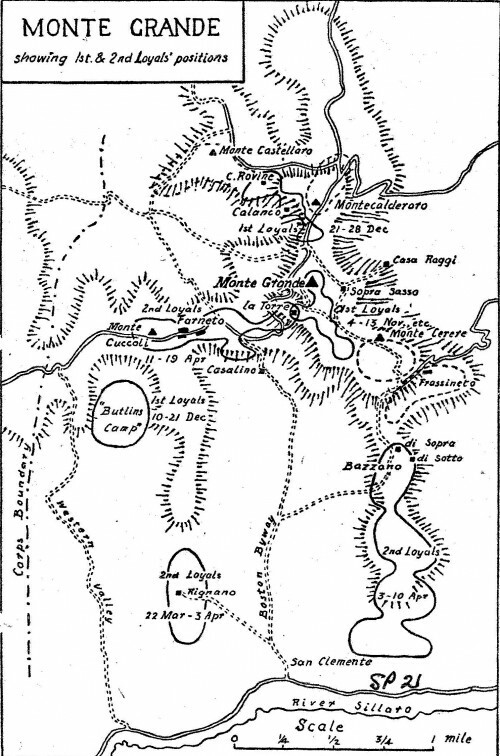 C Company, on the right occupied the western slope of Monte Grande near la Torre; D Company in the center held Canovetta and Farneto; and B Company on the left, was in position at di La and on Monte Cuccoli, A Company was in reserve between Canovetta and Casolino. The 2nd Layal’s were now under the command of the 25th Indian Infantry Brigade. The Jaipur State Light Infantry on their right, were holding Montecalderaro, and Skinner’s Horse, on their left, were on the Farneto ridge. The enemy were still in possession of Monte Castellaro, as wellas the valley between that hill and Farneto. On the 12th April, some days after the Eighth and Fifth Armies had opened their offensive, the XIII Corps were ordered to hand over their sector to the X Corps, and the 20th Indian Brigade began advancing down the Sillaro valley towards the Lombardy plain. Nevertheless, the enemy continued to hold on to their positions on the northern slopes of Monte Grande, and two days later Lieutenant D. Miller and three men were wounded by mortar-fire. On the 16th the 2nd Loyal’s came under the command of the Jewish Brigade, who then took over the defense of Monte Grande. The following day Castel San Pietro was taken by the Eighth Army, while the Fifth Army made considerable progress through the hills south and south-west of Bologna. These advances threatened the communications of the Germans in the Monte Grande area and forced them to withdraw. On the 19th April, the Jaipur Infantry on Montecalderaro moved forward and occupied Monte Castellaro without opposition. transport from San Clemente through Castel San Pietro and Medicina to a concentration area near Budrio, ten miles north of Castel San Pietro. On the 24th the Battalion went on four miles northwards to Mezzolara, where the troops bivouacked and training was begun. Six days later the 2nd Layal’s marched to the neighboring village of Chiesol del Fosso,and it was there, on the 2nd May, that they learnt that hostilities in Italy had ceased. During their brief time in the line the 2nd Loyal’s had had six men killed, and one officer and sixteen men wounded. Five men who had been taken prisoner later rejoined the Battalion. For their services in action Lance-Sergeant E. Norton and Lance-Corporal T. Mills were awarded the Military Medal. It was perhaps only fitting that the 2nd Loyal’s should have completed the task that the 1st Loyal’s had so well begun: the defence of Monte Grande. Authorities: War Diaries of the 1st Layal’s, 2nd Infantry Brigade and 2nd Loyal’s; Lieutenant-Colonel Rimbault’s narrative in The Loyal Regiment’s News Letter, February 1947 and supplementary notes: History of the 1st Division, August 1944 to January 1945 (Anon., printed in 1946); General Sir H. M. Wilson’s Report. August to December 1944; E. Linklater’s Campaign in Italy. Oh so very confusing San Clemete is more common than Smith in Italy. Based at San Clemente at Rignano sull Arno next to 67 Field Regt then off to San Clemente near Bologna both with hills and Rivers in the background. 67 were supposedly in Palestine by the end of Jan 1945. But did they in fact go north close to Imola or Bologna in 1944. Their OC Major David Shepherd lies in Argenta Gap War Cemetery having earned an MC on 21.12.44 dying of wounds on Christmas Day. But Where? The 67th Field Regt saw action at Monte Grande in late 1944. Leaving in Jan 1945 for Palestine. Still no news ref the OC being wounded in this locality.